Spring in Northern Michigan means plants and wildflowers popping up from the ground--and of course, it means morel mushroom time. Northern Michigan is a fabulous place to hunt for morels and many conversations during this time of year revolve around the "secret spot" and how many pounds of the tasty mushrooms are found. The morels are so popular in Northern Michigan that there is even a festival to celebrate them. At this Boyne City festival, hundreds of mushroom lovers from around the country come to seek that elusive delicacy-the marvelous morel. 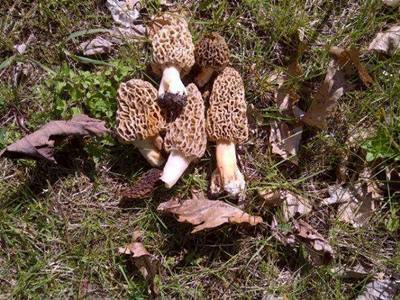 Found in nearby woods and clearings, morels are favored by those who know their mushrooms and during the festival, hunters hit to Northern Michigan woods to take home the top prize for the most mushrooms found. During the festival, everything is all about mushrooms. Restaurants prepare exotic, morel-laden entrees, local songsters sing of the morel, secret hunting places are discussed, but not shared. Recipes are definitely shared and everyone goes hunting. In a good year, hunters can find thousands of the mouth-watering treats. If you love morels, don't miss this unique--and tasty--festival! 1-6pm Craft Show in Veterans Park. Showcasing crafters with unique, hand-made items. 3:30pm Morel Seminar Featuring local morel expert Anthony Williams. Purchase morel soup from local restaurants. Beer & Wine available. 5pm Guided Morel Hunt. Departs from Veterans Park. 5:30pm & 8:30pm Morelfest Wine & Dine, the Beach House Restaurant. Advance reservations required, 231-582-6222. 7-10am Morel Breakfast, VFW Hall. 10-6pm Craft Show in Veterans Park. Showcasing crafters with unique, hand-made items. 12-3pm Taste of Morels. Purchase taste tickets at the door. Area restaurants & chefs providing morel infused delicacies! 4pm The great morel giveaway, enter at downtown stores to win a pound of morels. 7:30pm Concert Featuring local band, “Yankee Station”. Under the heated tent in Veteran’s Park. Beer and Wine available. 11-4pm Craft Show in Veterans Park. Showcasing crafters with unique, hand-made items.